No matter how hard you try to prevent it, you’ll inevitably find some strands of hair growing outside of your dreadlocks. When hair sheds, it’s replaced by new strands. As long as your hair is properly dreaded (check out our dreadlock tutorials for more information), most of these strands will naturally grow into your dreads with little effort. But what can you do about the loose hair that grows outside your dreads? Many dread heads have had success guiding loose hairs back into their dreadlocks using a crochet needle. Featuring a cane-like hook at the tip, crochet needles can scoop up loose strands of hair, allowing you to move them into your dreads. You’ll want to grab loose strands of hair with the crochet needle and pull them through the nearest dread. Continue doing this until you no longer have visible loose strands and you’re good to go! Another option is to let your loose hairs attach themselves to your dreadlocks naturally. Depending on how they grow, they may make their way into your dreads. Even if they don’t, though, loose hairs will often latch on to the sides of nearby dreadlocks, continuing to grow with the dreads. It’s perfectly normal for hair to grow along the outside of dreads. In fact, nearly everyone who has dreads will experience this. 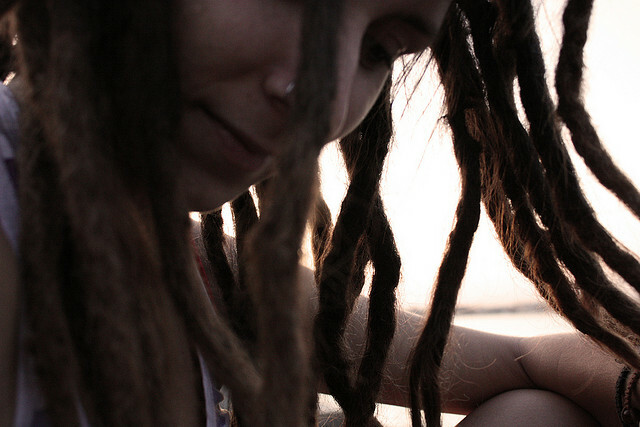 Have you noticed the tips of your dreadlocks coming unraveled? When this happens, the loose hair at the tips can trigger a chain reaction in which the body of your dreads begins to loosen. This is easily prevented by wrapping rubber bands around the tips. Using small, thin rubber bands (not the large industrial-sized kind), wrap the tips of your dreads nice and tight so they won’t unravel. Can I Trim My Loose Hair? Absolutely! If you’re unable to get the loose hair back into your dreads, or if you just don’t feel like messing with it, you can always trim it using a pair of styling shears. Place the scissors as close to the root as possible and make a clean cut, avoiding any nearby strands that are attached to your dreads. If the thought of cutting your own hair sounds frightening, ask a friend or family member to do it for you. How do you deal with loose hair? Let us know in the comments section below! Thanks for the info. I’ve been clipping the tips (not ball that’s hanging by a strand) and the loose hair.